Synthetic peptide conjugated to KLH derived from within residues 100 - 200 of Human HoxC6. Recombinant Human HoxC6 protein (ab116795) can be used as a positive control in WB. IHC-P 1/50. 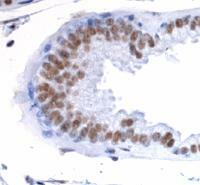 Some customers have used this antibody successfully in IHC-P; however this is not a tested application for this antibody. Sequence-specific transcription factor which is part of a developmental regulatory system that provides cells with specific positional identities on the anterior-posterior axis. Belongs to the Antp homeobox family. This Fast-Track antibody is not yet fully characterised. These images represent inconclusive preliminary data. Additional bands at: 44 kDa, 70 kDa, 75 kDa. We are unsure as to the identity of these extra bands. Publishing research using ab41587? Please let us know so that we can cite the reference in this datasheet. I've been using your Abcam Hoxc6 rabbit (ab41587) antibody for my ChIP experiments and I recently finished this antibody and ordered a new aliquot. The new one isn't as concentrated and when I test it on sectioned tissue, it did stain the HoxC6 positive cells in the spinal cord, but it did so VERY weakly with much more background. So the reason I'm emailing is I'd like to know if you have other older lots of this Hoxc6 antibody available so I could order a new aliquot of the same lot I used to use for my ChiP experiments. Unfortunately we do not have any more of lot 414179 in out stock, and because it is a Fast Track antibody, we cannot guarantee it to work in any application other that an ELISA with the immunizing peptide. If you can send me a copy of the protocol that you have been using, I will be more than happy to see if there is any suggestions I can make.